21-year-old American citizen, Katie Stubblefield is the youngest person ever in the history of USA to receive a full facial transplant. Stubblefield was born in 1997 in Mississippi, USA. 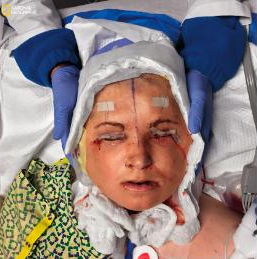 Katie Stubblefield's facial transplant undergo about record-breaking 31 hours operation and required 11 surgeons led by Dr, Brian Gastman. on March 5, 2014, Stubblefield at the age of 18, tried a suicide attempt in her bathroom at brother's house shooting through her chin with a 308-caliber hunting rifle but survived miraculously ( reason: she saw her boyfriend's texts with another girl). Stubblefield received a new face of 31-year-old Adrea Schneider, who died in May 2017 due to a drug overdose. Schneider's mother Sandra approved of transplant, but she yet is unaware of the face being used. US Department of Defense through the Armed Forces Institute of Regenerative Medicine funded the whole surgery for Stubblefield. National Geographic Photographer Maggie Steber came into the knowledge about Stubblefield and followed her day to day routine for two and half years. Stubblefield now wants to continue her studies to become a counselor/motivational speaker and work with other suicide survivors and raise awareness against suicide in the future.